The United States courts of appeals or circuit courts are the intermediate appellate courts of the United States federal court system. A court of appeals decides appeals from the district courts within its federal judicial circuit, and in some instances from other designated federal courts and administrative agencies. The United States courts of appeals are considered among the most powerful and influential courts in the United States. Because of their ability to set legal precedent in regions that cover millions of Americans, the United States courts of appeals have strong policy influence on U.S. law. Moreover, because the U.S. Supreme Court chooses to review fewer than 2% of the more than 7,000 to 8,000 cases filed with it annually, the U.S. courts of appeals serve as the final arbiter on most federal cases. The Ninth Circuit in particular is very influential, covering 20% of the American population. There are currently 179 judgeships on the U.S. courts of appeals authorized by Congress in 28 U.S.C. § 43 pursuant to Article III of the U.S. Constitution. These judges are nominated by the President of the United States and confirmed by the United States Senate. They have lifetime tenure, earning (as of 2016) an annual salary of $215,400. The actual number of judges in service varies, both because of vacancies and because senior judges who continue to hear cases are not counted against the number of authorized judgeships. There are thirteen U.S. courts of appeals, although there are other tribunals that have "Court of Appeals" in their titles, such as the Court of Appeals for the Armed Forces, which hears appeals in court-martial cases, and the United States Court of Appeals for Veterans Claims, which reviews final decisions by the Board of Veterans' Appeals in the Department of Veterans Affairs. The eleven numbered circuits and the D.C. Circuit are geographically defined. The thirteenth court of appeals is the United States Court of Appeals for the Federal Circuit, which has nationwide jurisdiction over certain appeals based on their subject matter. All of the courts of appeals also hear appeals from some administrative agency decisions and rulemaking, with by far the largest share of these cases heard by the D.C. Circuit. The Federal Circuit hears appeals from specialized trial courts, primarily the United States Court of International Trade and the United States Court of Federal Claims, as well as appeals from the district courts in patent cases and certain other specialized matters. Decisions of the U.S. courts of appeals have been published by the private company West Publishing in the Federal Reporter series since the courts were established. Only decisions that the courts designate for publication are included. The "unpublished" opinions (of all but the Fifth and Eleventh Circuits) are published separately in West's Federal Appendix, and they are also available in on-line databases like LexisNexis or Westlaw. More recently, court decisions have also been made available electronically on official court websites. However, there are also a few federal court decisions that are classified for national security reasons. The circuit with the smallest number of appellate judges is the First Circuit, and the one with the largest number of appellate judges is the geographically large and populous Ninth Circuit in the Far West. The number of judges that the U.S. Congress has authorized for each circuit is set forth by law in 28 U.S.C. § 44, while the places where those judges must regularly sit to hear appeals are prescribed in 28 U.S.C. § 48. Although the courts of appeals are frequently called "circuit courts", they should not be confused with the former United States circuit courts, which were active from 1789 to 1911, during the time when long-distance transportation was much less available, and which were primarily first-level federal trial courts that moved periodically from place to place in "circuits" in order to serve the dispersed population in towns and the smaller cities that existed then. The current "courts of appeals" system was established in the Judiciary Act of 1891, also known as the Evarts Act. Because the courts of appeals possess only appellate jurisdiction, they do not hold trials. Only courts with original jurisdiction hold trials and thus determine punishments (in criminal cases) and remedies (in civil cases). Instead, appeals courts review decisions of trial courts for errors of law. Accordingly, an appeals court considers only the record (that is, the papers the parties filed and the transcripts and any exhibits from any trial) from the trial court, and the legal arguments of the parties. These arguments, which are presented in written form and can range in length from dozens to hundreds of pages, are known as briefs. Sometimes lawyers are permitted to add to their written briefs with oral arguments before the appeals judges. At such hearings, only the parties' lawyers speak to the court. Many decades ago, certain classes of federal court cases held the right of an automatic appeal to the Supreme Court of the United States. That is, one of the parties in the case could appeal a decision of a court of appeals to the Supreme Court, and it had to accept the case. The right of automatic appeal for most types of decisions of a court of appeals was ended by an Act of Congress, the Judiciary Act of 1925, which also reorganized many other things in the federal court system. Passage of this law was urged by Chief Justice William Howard Taft. The current procedure is that a party in a case may apply to the Supreme Court to review a ruling of the circuit court. This is called petitioning for a writ of certiorari, and the Supreme Court may choose, in its sole discretion, to review any lower court ruling. In extremely rare cases, the Supreme Court may grant the writ of certiorari before the judgment is rendered by the court of appeals, thereby reviewing the lower court's ruling directly. Certiorari before judgment was granted in the Watergate scandal-related case, United States v. Nixon, and in the 2005 decision involving the Federal Sentencing Guidelines, United States v. Booker. A court of appeals may also pose questions to the Supreme Court for a ruling in the midst of reviewing a case. This procedure was formerly used somewhat commonly, but now it is quite rare. The Second Circuit, sitting en banc, attempted to use this procedure in the case United States v. Penaranda, as a result of the Supreme Court's decision in Blakely v. Washington, but the Supreme Court dismissed the question after resolving the same issue in another case, which had come before the Court through the standard procedure. The last instance of the Supreme Court accepting a set of questions and answering them was in a case in 1982. A court of appeals may convene a Bankruptcy Appellate Panel to hear appeals in bankruptcy cases directly from the bankruptcy court of its circuit. As of 2008, only the First, Sixth, Eighth, Ninth, and Tenth Circuits have established a Bankruptcy Appellate Panel. Those circuits that do not have a Bankruptcy Appellate Panel have their bankruptcy appeals heard by the District Court. Courts of appeals decisions, unlike those of the lower federal courts, establish binding precedents. Other federal courts in that circuit must, from that point forward, follow the appeals court's guidance in similar cases, regardless of whether the trial judge thinks that the case should be decided differently. Federal and state laws can and do change from time to time, depending on the actions of Congress and the state legislatures. Therefore, the law that exists at the time of the appeal might be different from the law that existed at the time of the events that are in controversy under civil or criminal law in the case at hand. A court of appeals applies the law as it exists at the time of the appeal; otherwise, it would be handing down decisions that would be instantly obsolete, and this would be a waste of time and resources, since such decisions could not be cited as precedent. "[A] court is to apply the law in effect at the time it renders its decision, unless doing so would result in manifest injustice, or there is statutory direction or some legislative history to the contrary." When the courts of appeals were created in 1891, one was created for each of the nine circuits then existing, and each court was named the "United States Circuit Court of Appeals for the _____ Circuit". When a court of appeals was created for the District of Columbia in 1893, it was named the "Court of Appeals for the District of Columbia", and it was renamed to the "United States Court of Appeals for the District of Columbia" in 1934. In 1948, Congress renamed all of the courts of appeals then existing to their current formal names: the court of appeals for each numbered circuit was named the "United States Court of Appeals for the _____ Circuit", and the "United States Court of Appeals for the District of Columbia" became the "United States Court of Appeals for the District of Columbia Circuit". 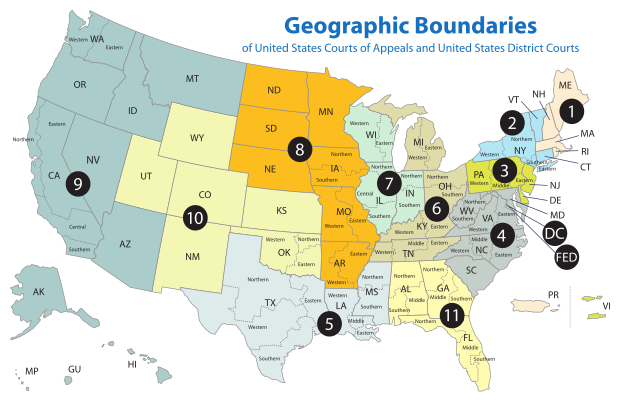 The Tenth Circuit was created in 1929 by subdividing the existing Eighth Circuit, and the Eleventh Circuit was created in 1981 by subdividing the existing Fifth Circuit. The Federal Circuit was created in 1982 by the merger of the United States Court of Customs and Patent Appeals and the appellate division of the United States Court of Claims. Judicial councils are panels in each circuit that are charged with making "necessary and appropriate orders for the effective and expeditious administration of justice" within their circuits. Among their responsibilities is judicial discipline, the formulation of circuit policy, the implementation of policy directives received from the Judicial Conference of the United States, and the annual submission of a report to the Administrative Office of the United States Courts on the number and nature of orders entered during the year that relate to judicial misconduct. Judicial councils consist of the chief judge of the circuit and an equal number of circuit judges and district judges of the circuit. ^ a b c These are article IV territorial courts and are therefore not part of the federal judiciary. ^ The Federal Circuit also has appellate jurisdiction over certain claims filed in any district court. ^ a b These are article I tribunals and are therefore not part of the federal judiciary. ^ a b c d e f g h These are administrative bodies within the executive branch and are therefore not part of the federal judiciary. ^ This is an administrative body within the legislative branch are therefore not part of the federal judiciary. Based on 2010 United States Census figures, the population residing in each circuit is as follows. The Midnight Judges Act reorganized the districts into six circuits, and created circuit judgeships so that Supreme Court justices would no longer have to ride circuit. This Act, however, was repealed in March 1802, and Congress provided that the former circuit courts would be revived as of July 1 of that year. But it then passed the new Judiciary Act of 1802 in April, so that the revival of the old courts never took effect. The 1802 Act restored circuit riding, but with only one justice to a circuit; it therefore created six new circuits, but with slightly different compositions than the 1801 Act. These six circuits later were augmented by others. Until 1866, each new circuit (except the short-lived California Circuit) was accompanied by a newly created Supreme Court seat. ^ The Federal Circuit's jurisdiction is not based on geography; rather, the Federal Circuit has jurisdiction over the entire United States, for certain classes of cases. ^ There were U.S. Federal Courts in the Philippines following the Spanish–American War of 1898 up through the granting of independence to the Philippines on July 4, 1946—with the exception of the Philippine occupation by the Japanese Army in 1942–45. ^ 28 U.S.C. § 43 provides that "There shall be in each circuit a court of appeals, which shall be a court of record, known as the United States Court of Appeals for the circuit". ^ U.S. Supreme Court FAQ Retrieved 7 September 2016. ^ Judicial Compensation U.S. Courts. Retrieved 7 September 2016. ^ The U.S. Courts of Appeals and the Federal Judiciary, History of the Federal Judiciary, Federal Judicial Center (last visited March 5, 2014). The Biographical Directory of Federal Judges is a publication of the Federal Judicial Center providing basic biographical information on all past and present United States federal court Article III judges (those federal judges with life tenure). These include justices of the Supreme Court of the United States and judges of United States courts of appeals, district courts, and the now-obsolete circuit courts. The Biographical Directory is available online in searchable format. Biographical information provided for each judge includes birth and death dates, educational background, a summary of the judge's professional career and a summary of the judge's federal judicial service (including dates of nomination, confirmation, and acceptance of commission.) Where available, links to the location of the judge's manuscript papers, biographical sources, and oral history sources are also provided. As a non-copyrighted work of the United States government, the Biographical Directory is in the public domain within the United States. A chief judge (also known as chief justice, presiding judge, president judge or administrative judge) is the highest-ranking judge of a court that has more than one judge and commonly presides over that court's hearings. The Federal Appendix is a case law reporter published by West Publishing. It publishes judicial opinions of the United States courts of appeals that have not been expressly selected or designated for publication. Such "unpublished" cases are ostensibly without value as precedent. However, the Supreme Court made a change to the Federal Rules of Appellate Procedure in 2006. Now, Rule 32.1 says that federal circuit courts are not allowed to prohibit the citation of unpublished opinions issued on or after January 1, 2007. Opinions of all the United States courts of appeals are included in the Federal Appendix. "Published" opinions of the U.S. courts of appeals are published in the Federal Reporter. The Federal Appendix organizes court opinions within each volume by the date of the decision, and includes the full text of the court's opinion. West editors add headnotes that summarize key principles of law in the cases, and Key Numbers that classify the decisions by topic within the West American Digest System. Over 700 hardbound volumes of the Federal Appendix have been issued since it began publication in 2001. Westlaw abbreviates citations to the Federal Appendix as Fed. Appx. The Bluebook calls for citations to the Federal Appendix to be abbreviated as F. App'x.There is debate within the legal community about the desirability of designating certain judicial opinions as without precedential value. The Federal Reporter is a case law reporter in the United States that is published by West Publishing and a part of the National Reporter System. It begins with cases decided in 1880; pre-1880 cases were later retroactively compiled by West Publishing into a separate reporter, Federal Cases. The third and current Federal Reporter series publishes decisions of the United States courts of appeals and the United States Court of Federal Claims; prior series had varying scopes that covered decisions of other federal courts as well. Though West is a private company that does not have a legal monopoly over the court opinions it publishes, it has so dominated the industry in the United States that legal professionals, including judges, uniformly cite to the Federal Reporter for included decisions. It is estimated that the Fourth Series of the Federal Reporter will begin sometime around 2025. The United States Reports are the official law reports of the rulings, orders, case tables, and other proceedings of the Supreme Court of the United States. The Federal Rules of Appellate Procedure (officially abbreviated Fed. R. App. P.; colloquially FRAP) are a set of rules, promulgated by the Supreme Court of the United States on recommendation of an advisory committee, to govern procedures in cases in the United States Courts of Appeals. The Federal Rules of Appellate Procedure were originally adopted in 1967 and have been amended regularly since then. Prior to 1967, some aspects of appellate procedure were covered in the Federal Rules of Civil Procedure. In addition to these rules, procedure in the Courts of Appeals is governed by applicable statutes (particularly Title 28 of the United States Code) and by local rules adopted by each individual court. Many of these local rules incorporate Federal Rules of Appellate Procedure by reference. Judicial councils are panels of the United States federal courts that are charged with making "necessary and appropriate orders for the effective and expeditious administration of justice" within their circuits. Among their responsibilities is judicial discipline, the formulation of circuit policy, the implementation of policy directives received from the Judicial Conference of the United States, and the annual submission of a report to the Administrative Office of the United States Courts on the number and nature of orders entered during the year that relate to judicial misconduct. Each US judicial circuit has a judicial council, which consists of the chief judge of the circuit and an equal number of circuit judges and district judges of the circuit. Every year, each of the thirteen United States courts of appeals decides hundreds of cases. Of those, a few are so important that they later become models for decisions of other circuits, and of the United States Supreme Court, while others are noted for being dramatically rejected by the Supreme Court on appeal. Still others are notable for being written with such a clear and concise explanation of the states of the law that they are used by multiple law school casebooks to teach the area of law addressed. The notable decisions of these courts are listed in chronological order by circuit. Following is a list of all Article III United States federal judges appointed by President Benjamin Harrison during his presidency. In total Harrison appointed 42 Article III federal judges, including 4 Justices to the Supreme Court of the United States, 12 judges to the United States courts of appeals and United States circuit courts and 26 judges to the United States district courts. Additionally, Harrison appointed 1 judge to the United States Court of Claims and 10 members to the Board of General Appraisers (later the United States Customs Court), both Article I tribunals. The Judiciary Act of 1891, approved March 3, 1891, established the United States courts of appeals. Prior to the passage of that act, United States Circuit Judges were appointed solely to the existing United States circuit courts. Subsequent to the passage of that act, United States Circuit Judges were concurrently appointed to both the United States courts of appeals and the United States circuit courts. This situation persisted until the abolition of the United States circuit courts on December 31, 1911. Starting January 1, 1912, United States Circuit Judges served only upon their respective United States court of appeals. Thus, the first 2 United States Circuit Judges appointed during Harrison's administration were appointed solely to the United States circuit court for their respective circuit and were reassigned by operation of law to serve concurrently on the United States court of appeals and United States circuit court on June 16, 1891. The 10 United States Circuit Judges appointed by Harrison after June 16, 1891 were appointed concurrently to the United States court of appeals and United States circuit court. Following is a list of all Article III United States federal judges appointed by President Grover Cleveland during his presidency. In total Cleveland appointed 45 Article III federal judges, including 4 Justices to the Supreme Court of the United States (including 1 Chief Justice), 11 judges to the United States courts of appeals and United States circuit courts and 30 judges to the United States district courts. Additionally, Cleveland appointed 2 judges to the United States Court of Claims, an Article I tribunal. The Judiciary Act of 1891, approved March 3, 1891, during the intervening administration of President Benjamin Harrison, established the United States courts of appeals. Prior to the passage of that act, United States Circuit Judges were appointed solely to the existing United States circuit courts. Subsequent to the passage of that act, United States Circuit Judges were concurrently appointed to both the United States courts of appeals and the United States circuit courts. This situation persisted until the abolition of the United States circuit courts on December 31, 1911. Starting January 1, 1912, United States Circuit Judges served only upon their respective United States court of appeals. Thus, the 2 United States Circuit Judges appointed during Cleveland's first administration were appointed solely to the United States circuit court for their respective circuit and were reassigned by operation of law to serve concurrently on the United States court of appeals and United States circuit court on March 3, 1891. The 6 United States Circuit Judges appointed to numbered circuits during Cleveland's second administration were appointed concurrently to the United States court of appeals and United States circuit court. The Court of Appeals for the District of Columbia (now the United States Court of Appeals for the District of Columbia Circuit) was established on February 9, 1893. As the United States Circuit Court for the District of Columbia had been abolished in 1863, the judges of this newly established court served only on the Court of Appeals and had no concurrent Circuit Court service. Cleveland appointed 3 judges to this newly established court during his second administration. District of South DakotaThe court is composed of eleven active judges and is based primarily at the Thomas F. Eagleton United States Courthouse in St. Louis, Missouri and secondarily at the Warren E. Burger United States Courthouse in St. Paul, Minnesota. It is one of thirteen United States courts of appeals. In 1929 Congress passed a statute dividing the Eighth Circuit that placed Minnesota, Iowa, North Dakota, South Dakota, Nebraska, Missouri, and Arkansas in the Eighth Circuit and created a Tenth Circuit that included Wyoming, Colorado, Utah, New Mexico, Kansas, and Oklahoma. Southern District of GeorgiaThese districts were originally part of the Fifth Circuit, but were split off to form the Eleventh Circuit effective October 1, 1981. For this reason, Fifth Circuit decisions from before this split are considered binding precedent in the Eleventh Circuit.The court is based at the Elbert P. Tuttle U.S. Court of Appeals Building in Atlanta, Georgia, named for Elbert Tuttle who served as Chief Judge of the Fifth Circuit in the 1960s and was known for issuing decisions which advanced the civil rights of African-Americans. Eleventh Circuit Judge Gerald Bard Tjoflat is currently the longest-serving federal appeals court judge still in active service, having served since 1975. The Eleventh Circuit is one of the thirteen United States courts of appeals. Western District of TexasThe court is one of 13 United States courts of appeals. Composed of 17 active judges, it is based at the John Minor Wisdom United States Court of Appeals Building in New Orleans, Louisiana, with the clerk's office located at the F. Edward Hebert Federal Building in New Orleans. District of Rhode IslandThe court is based at the John Joseph Moakley Federal Courthouse in Boston, Massachusetts. Most sittings are held in Boston, where the court usually sits for one week most months of the year; in one of July or August, it takes a summer break and does not sit. The First Circuit also sits for one week each March and November at the Jose V. Toledo Federal Building and United States Courthouse in Old San Juan, Puerto Rico, and occasionally sits at other locations within the circuit.With six active judges and four active senior judges, the First Circuit is the smallest of the thirteen United States courts of appeals. Since retiring from the United States Supreme Court, Associate Justice David Souter regularly sits on the First Circuit by designation. Southern District of West VirginiaThe court is based at the Lewis F. Powell Jr. United States Courthouse in Richmond, Virginia. With 15 authorized judgeships, it is mid-sized among the 13 United States Courts of Appeals. District of VermontThe Second Circuit has its clerk's office and hears oral arguments at the Thurgood Marshall United States Courthouse at 40 Foley Square in Lower Manhattan. Due to renovations at that building, from 2006 until early 2013, the court temporarily relocated to the Daniel Patrick Moynihan United States Courthouse across Pearl Street from Foley Square, and certain court offices temporarily relocated to the Woolworth Building at 233 Broadway.Several notable judges have served on the Second Circuit, including three later named Associate Justices of the United States Supreme Court: John Marshall Harlan II, Thurgood Marshall, and Sonia Sotomayor. Judge Learned Hand served on the court from 1924 to 1961, as did his cousin, Augustus Noble Hand, from 1927 until 1953. Judge Henry Friendly served from 1959 to 1986. Western District of WisconsinThe court is based at the Dirksen Federal Building in Chicago, Illinois and is composed of eleven appellate judges. It is one of thirteen United States courts of appeals. The court offers a relatively unique internet presence that includes wiki and RSS feeds of opinions and oral arguments. It is also notable for having one of the most prominent law and economics scholars, Judge Frank H. Easterbrook, on its court. Richard Posner, another prominent law and economics scholar, also served on this court until his retirement in 2017. Western District of TennesseeThe court is composed of sixteen judges and is based at the Potter Stewart U.S. Courthouse in Cincinnati, Ohio. It is one of thirteen United States courts of appeals. William Howard Taft, the only person ever to serve as both President and Chief Justice of the United States, once served on the circuit. Four other judges of the Sixth Circuit have been elevated to serve on the Supreme Court. Decisions issued by the Sixth Circuit were reversed by the United States Supreme Court 24 out of the 25 times that they were reviewed in the five annual terms starting in October 2008 and ending in June 2013, a higher rate of reversal than for any other federal appellate court during that time period. District of WyomingThese districts were part of the Eighth Circuit until 1929. The court is composed of twelve active judges and is based at the Byron White U.S. Courthouse in Denver, Colorado. It is one of thirteen United States courts of appeals and has jurisdiction over 560,625 square miles, or roughly 20 percent of the country's land mass. District Court of the Virgin IslandsThis court was created under Article IV of the U.S. Constitution, rather than Article III under which the other district courts in the Circuit were created.